One of the greatest things about glamping is its inclusivity. You can make your holiday exactly what you want it to be; lazy or active, romantic or family-friendly – it’s completely up to you! 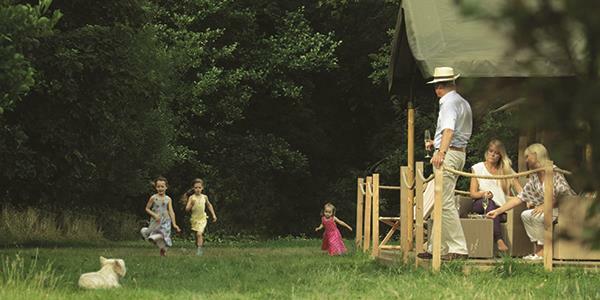 Young and old alike are sure to love spending a few days in a luxurious tent, exploring the British countryside. But glamping is not only a great choice for people of ages… it's one of the best types of holiday to enjoy with your four-legged friends too! Here at Lantern & Larks we know the worst thing about going away is having to leave your furry friend behind. After all, no one enjoys having to put their dog in a kennel, or worrying about what they’re up to whilst you’re away. That’s why we’ve made sure that you don't have to worry about that any more. You can bring all of your dogs with you on your Lantern & Larks break and enjoy a fantastic get-away with the whole family. Dogs love glamping. They have the run of the great outdoors, get to explore new places, follow new smells and discover new things. At the end of the day, they can curl up beside a warm firepit and dream of their adventures. And most importantly… they get to spend time with you! Our glamping sites have been handpicked for their perfect positions and can boast an incredible array of things to see and do (for the two-legged and the four-legged alike). Together you can explore stunning walks and hint of adventure, without having to compromise on luxury. Our colonial-style canvas retreats are fully furnished with real bedrooms, hot running water, solid decking flooring, a spacious open plan living/dining area and everything you could possibly need for a fun-filled get-away. If you fancy adventuring further afield, there are dozens of dog-friendly days out to discover. From nature reserves to market towns, there’s plenty to keep everyone entertained. And, of course, there’s nothing like a cool drink in a dog-friendly pub garden to round off any adventure. With numerous dog friendly attractions, unspoilt countryside and miles of beaches right on your doorstep, there’s so much for you and your furry friend to explore – even the most active pooches will be happy to collapse next to a warm stove at the end of a fun day exploring. We have Lantern & Larks glamping sites close to the coast in Suffolk, a stone's throw from the huge nature reserve in Rutland, on the edge of the Forest of Bowland in Lancashire and right in the heart of the Somerset countryside. So book your next break now and get those tails wagging! Discover our glamping sites here.